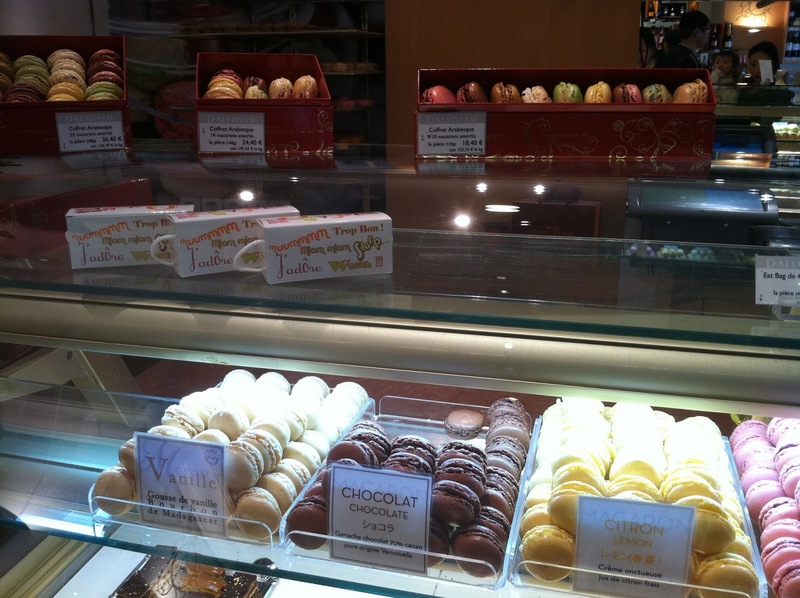 La Belle Boulangerie: Welcome Back! Wow where do I even begin? 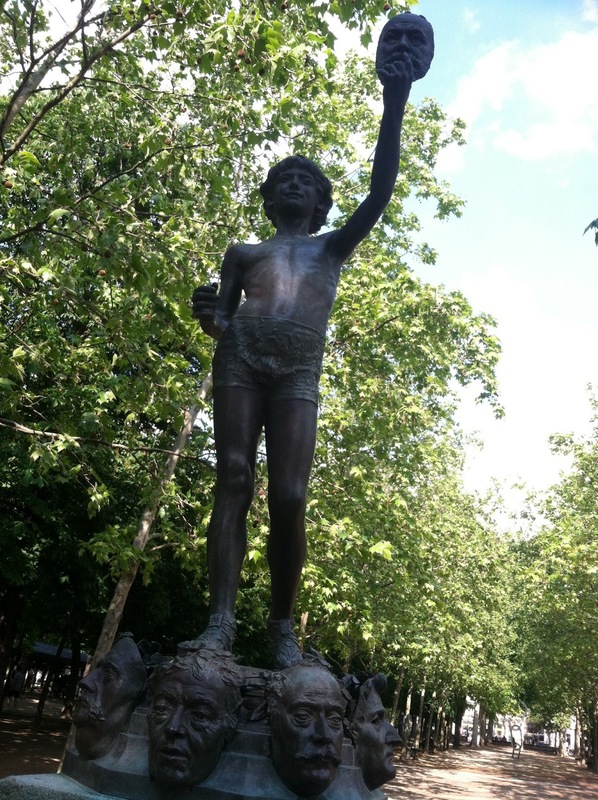 After a five-month hiatus from this beloved blog, I'm back! 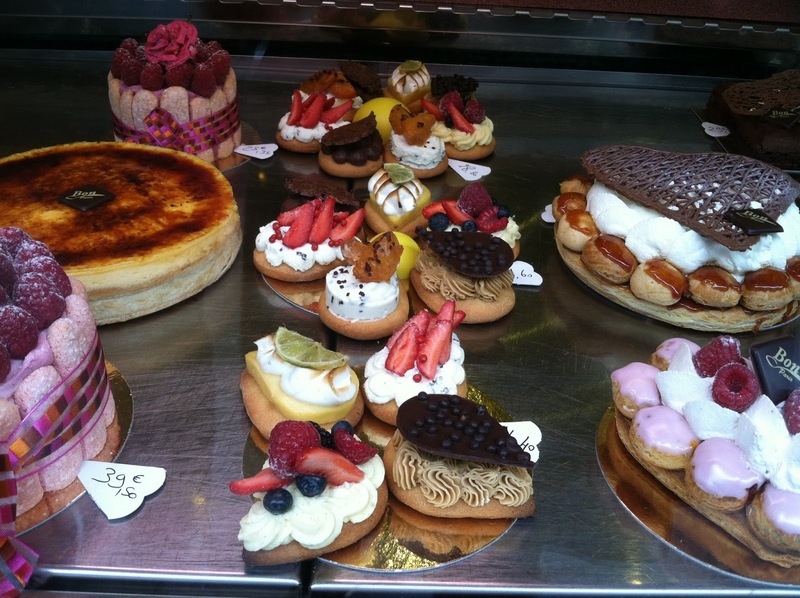 ... no not blanch airplane food (that's just the beginning) - get ready for a gastronomic journey in France! 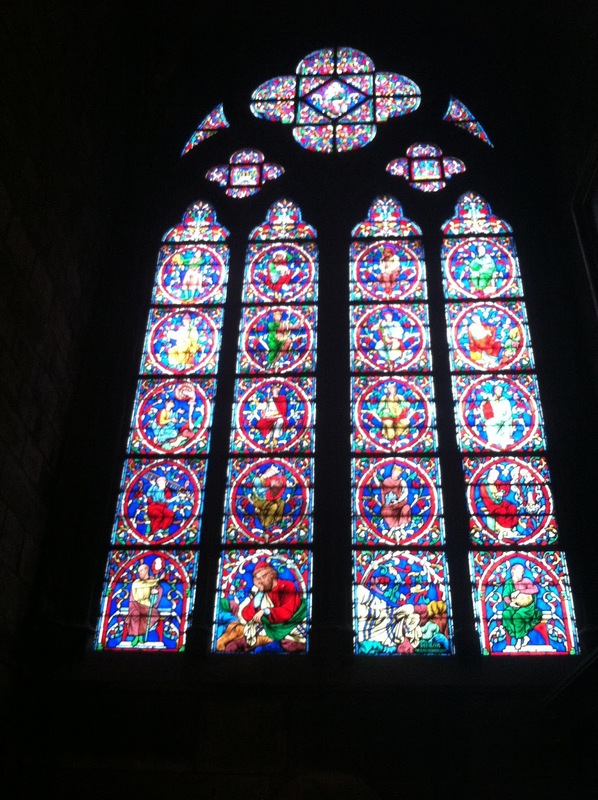 This year hubby and I went to France for our vacation. It was - as the French would say - parfait! Well ok not exactly perfect, with the airline losing my baggage and all, leaving me baggage-less for two days in Paris. Nevertheless, I tried to make the most out of it. After arriving at the airport Charles de Gaulle, I was immediately immersed in the frenchiness (for a lack of a better word) of the atmosphere. 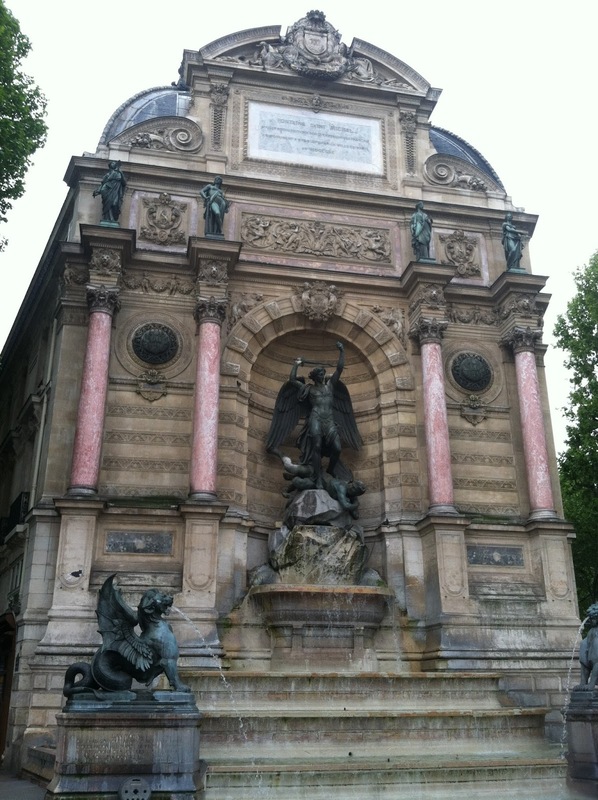 Our first hotel in Paris was called the Grand Hotel St. Michel, located in the Latin Quartier. 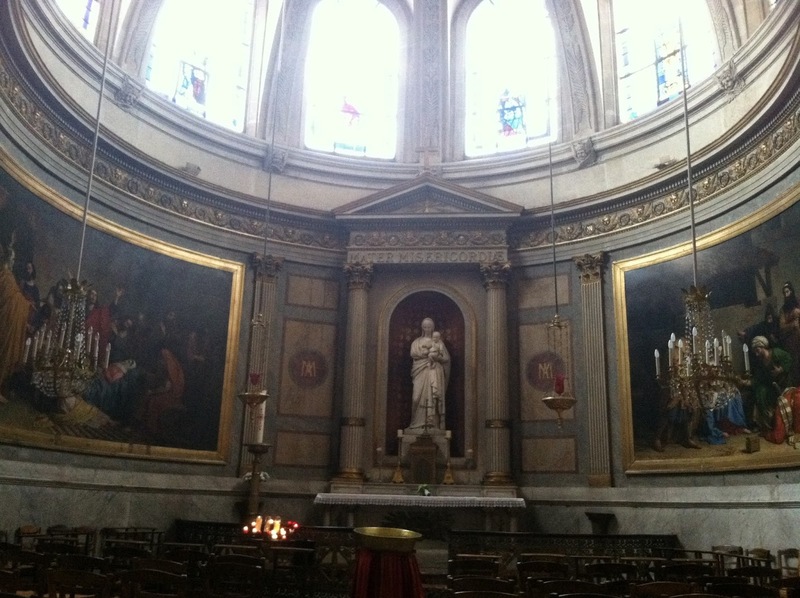 For those who has never been, Latin Quartier is the trendier, hippier part of Paris near the Sorbonne campus of the University of Paris. When we got in, it was tea-time at the hotel. 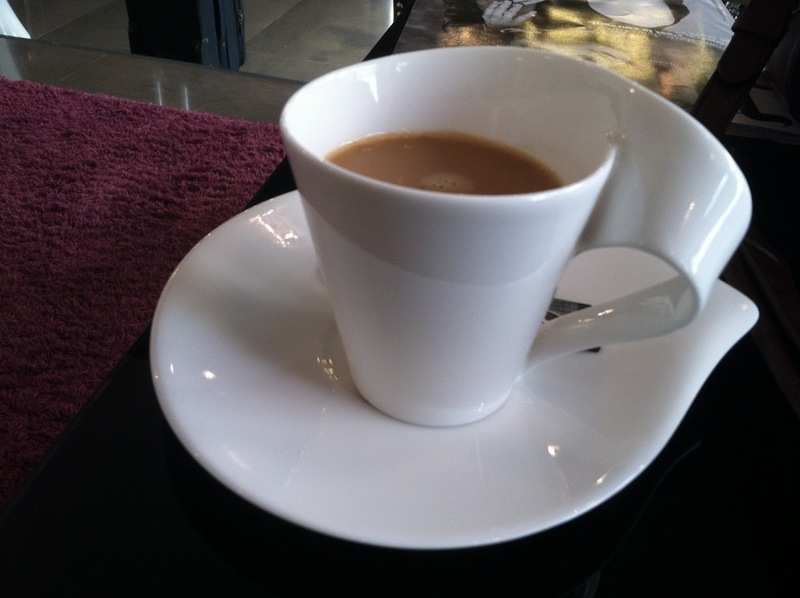 I made myself a nice cup of European instant coffee with real thick cream while hubby checked us in. Just like the coffee cup, the room was pretty small, but quaint with a lovely balcony view of the surroundings. Since we had just eaten "breakfast" on the plane (that first picture you saw), we weren't all that hungry, even though it was 5pm already in Paris. 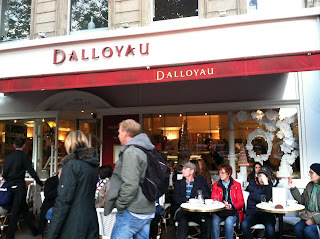 You can't imagine how ecstatic I was when I stumbled upon Dalloyau, one of the much lauded patisseries in Paris. 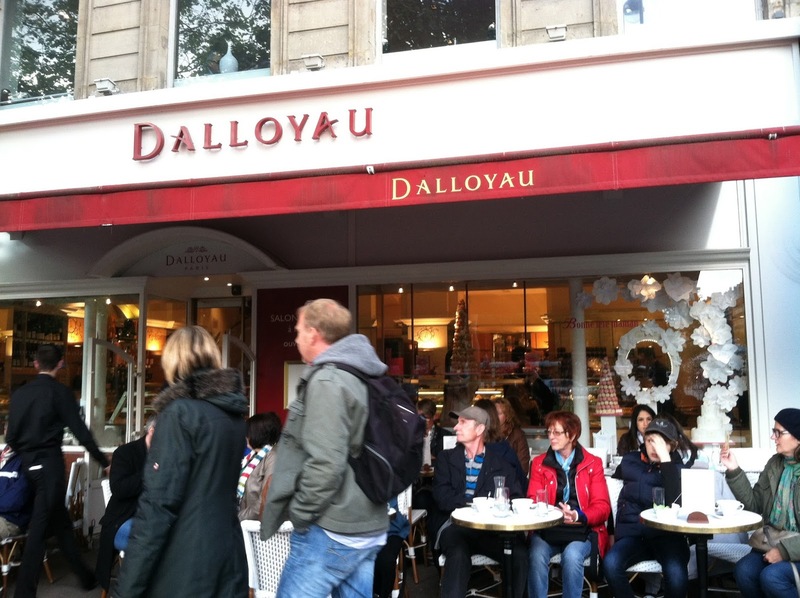 It was one of the must-eat sites from my tour guide book, and I guess other tourists must have had the same book because the outside patio was flocked by tourists taking pictures of miniscule pastry and expresso. 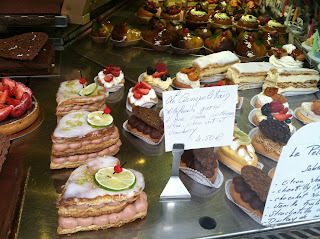 The portions in Paris were quite European, nothing like the extra large coffee and doughnuts of America. They specialize in macaroons - dainty and pretty, they were quite eye-catching. We got a little box of four macaroons with vanilla, salted caramel, coffee and pistachio. It costed 8.50 Euros, but oh well, c'est la vie. 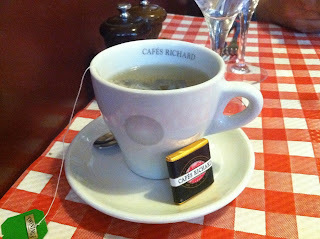 I really liked the coffee one - it had the most distinctive flavour out of all of them. 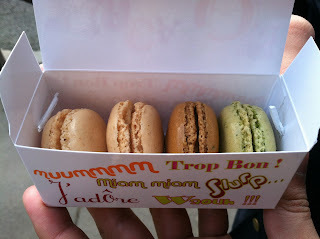 The salted caramel was a bit lacking on the salty part, while the pistachio lacked the nutty kick. Vanilla was just average. I really wished my stomach (and wallet) was large enough to try a bit of everything! 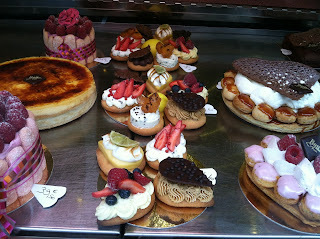 If only they had a sampler tray, I would have gone to patisserie heaven. 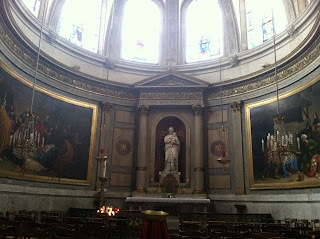 So to make myself feel better, we went to see images of heaven in the nearby church. 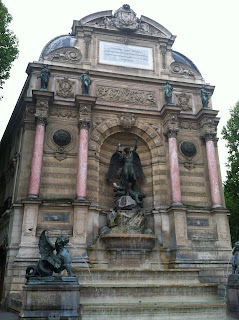 There are, I should mention, so much history and culture on every street. 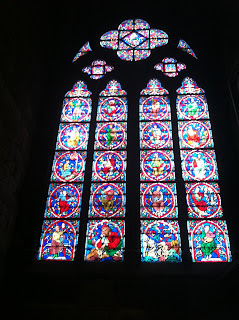 So much so that you feel as if you have entered a time portal back to the 15th century. The streets are lined up with cobble stones and the buildings remind you of an era bygone. After burning off some calories, it was time to enjoy a delicious French repas. I had searched up various restaurants near our hotel prior to coming, so we went directly to Restaurant Parraudin, a little diner tucked away in one of the cobble-street alleys. We were greeted by two chirpy waiters who asked us if we had a reservation. When I replied in my best french no, they seemed a little agitated, as they had a large party reservation later on. So they put us to a small table near the wall. It was quite an American crowd - I guess every checks up Yelp now for help on dining selections. The table near us were a group of southern belles trying French food for the first time. I guess due to the large influx of American customers, the waiters could speak English very well, and the menu has English translations. Hubby ordered off the menu fixe, which included an appetizer, entree and desert. I ordered the duck with honey mustard sauce. With our appetizer (entree as they called it in France), we were served with a basket of bread, but no butter. When I asked for the butter, the chirpy waiter asked in English, "You are going to eat butter with that? ", pointing to the meat loaf, to which I nodded. He must have thought us crazy for adding extra cholesterol to an already fattening meal. But I could care less. 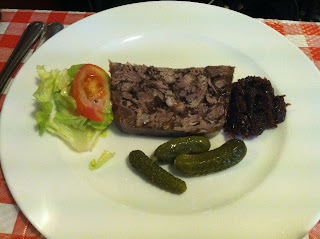 The terrine was marvelous - it tasted like jelly embedded with marinated beef. The way to eat this is to cut up half your bread then smother some onto it. Then you can put some of the side sauce - Christmas sauce as they called it - which added some sweetness to the mixture. The result was amazing. Pickles were out of a jar though, and so were the lettuce and tomatoes. 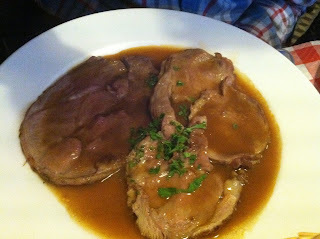 For his entree, hubby got the lamb in red-wine sauce. The three thin slices of lamb were cooked medium well, which was just on point for the tender meat to melt into the sauce. 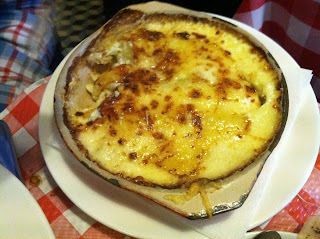 Hubby's lamb came with a side of potato gratin, which was doused in layers upon layers of cheese. He enjoyed it very much, but I thought it was a little too cheesy for my liking. I was surprised at the dish that the waiter brought me - I was shocked that it was mine, because it looked so picturesque, almost like a painting of French countryside. The potatoes were divine - soaked with the sweet savory sauce, it was tender on the inside while al dente enough to give it some texture. The duck on the other hand was a bit undercooked. I had asked for medium-well just like hubby's lamb, but I had forgotten that duck tastes much longer to cook (think Peking duck's 48 hour drying process). 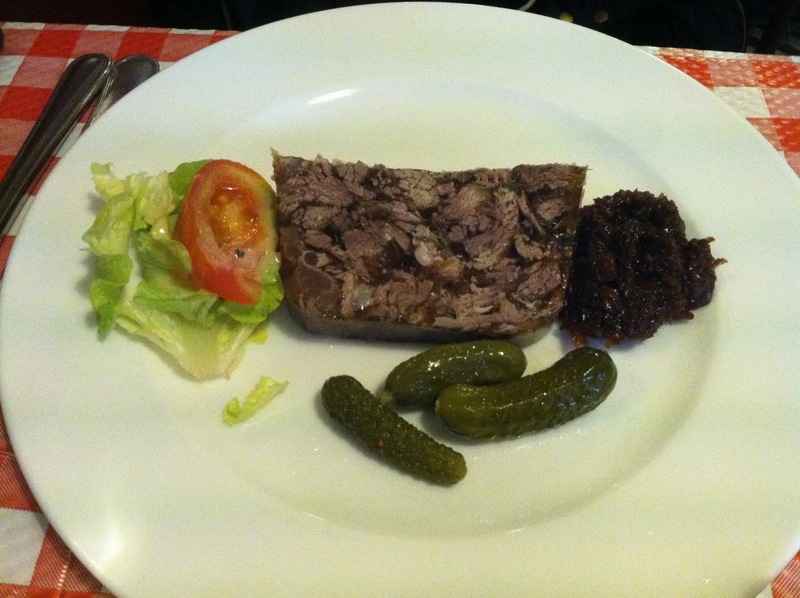 So my duck tasted a bit more raw and a lot more chewy that I had expected it to be. After gnawing for half an hour, I finally gave up and discarded three pieces of duck. When the chirpy waiter came to clear our plates, he was like, "Uhhh, you didn't finish miss. I'm not taking this until you do." For a moment, I thought he was serious. Thankfully he was just kidding, since my mouth or stomach couldn't handle it anymore. 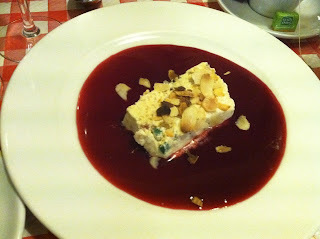 For desert, we had the nougat ice cream on a bed of raspberry sauce. This dish looked and tasted like Christmas in May. It was crunchy with the sliced almonds sprinkled on top, but at the same time soft with just the right amount of sugar for the ice cream. Then the raspberry sauced added a nice counterbalance to the sweetness by adding a hint of tartness. Only downside was that this serving was a bit too small to satisfy my sweet tooth. By the time we finished, the Irish (or Scottish?) 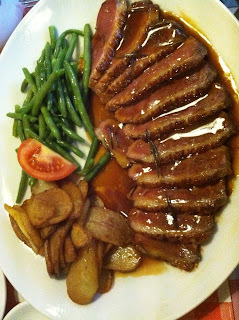 family beside us were enjoying their beef bourgignon, steak fillet and salmon. The beef and salmon looked really good, the former with generous chunks of beef and white Yukon potatoes lathered in a dark brown concoction, and the latter with buttery spinach and pink salmon intertwined in veggie-meat harmony. Their dessert - profiteroles with vanilla ice cream sandwiched between pastry and drizzled with chocolate sauce - looked really good too. Stuffed and a little dizzy from tasty the lamb with the wine sauce, we walked back to the hotel. It was pretty chilly so we didn't get to take some time to burn off some of the meal. All and all, a great meal to start off a French sojourn! 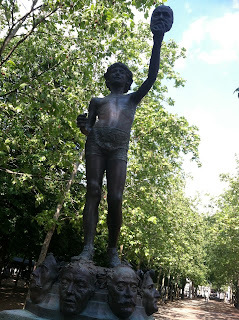 Another statue from antiquity-lined street - an ode to food!